My Tractor-Trailer Tipped Over After Load Was Packed. What Can I Do? Home » The Law & You » My Tractor-Trailer Tipped Over After Load Was Packed. What Can I Do? A tractor-trailer driver says his truck tipped over. He wasn’t responsible for packing the load. Is there something he can do? 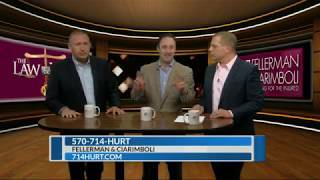 Truck accident lawyers Greg Fellerman and Ed Ciarimboli explain. Dave Kuharchik: We have an issue today involving a tractor-trailer. The tractor-trailer specialists are here, attorneys Greg Fellerman and Ed Ciarimboli. Boy, this is in your wheelhouse. Ed Ciarimboli: We can do this one. Greg Fellerman: We got it. Dave: All right, so here’s the setup — let’s talk to one of our viewers, we’re going to see what Victor from Dunmore has to say. Victor says, “I drive a tractor-trailer and it tipped over. I didn’t pack the load. What can I do?” So Victor seems to think the load was packed improperly. Ed: In every single solitary tractor-trailer case, you’re going to get a piece of paper, it’s called a bill of lading. So the first thing that as the driver you’re going to want to do is, that bill of lading is going to identify who the shipper was in that particular case. And it’s also going to identify whether it’s a sealed load or not a sealed load, and that’s really going to tell you who packed it. So you’re going to find out who packed it from that bill of lading. This is called a load shifting case. Loads have to be packed in a manner that prevents them from being shifted, the weight shifting so that you’re going around a corner, obviously, it’s not unbalanced and it tips over. We’ve had a number of these cases. So the case is going to be against whoever packed that load and did it incorrectly. Greg: These are good cases, you need to get an attorney involved ASAP because soon as that rig tips over, I can assure you the employer, the trucking company, have people out there, preserving the evidence, doing whatever they need to do to cover their legal perspective of the case. So we want to make sure we cover yours for you. Dave: Absolutely. Now let’s say someone gets into an accident. You guys are recommending acting fast all the time and documenting the evidence you can get. But, if they need to, they can call you or reach out online. Greg: Yeah, we have a rapid response team. We get them out within hours, we get experts, all kinds of people out to do what they need to do. Ed: It’s the last thing people are thinking about in a situation like this. But you really need to be very proactive, you need to be aggressive in protecting your rights because, as Greg said, they’re going to be out there covering their legal bases. But you need to get on it immediately. Dave: All right. Don’t forget, results matter. Attorneys Greg Fellerman and Ed Ciarimboli, we’ll see you next time, guys.